US Consul General Todd Holmstrom, along with Vice Consuls Vanessa Whittington, Kareema Dauod-Akguc and Morgan Miles, received American pilgrims on Thursday. 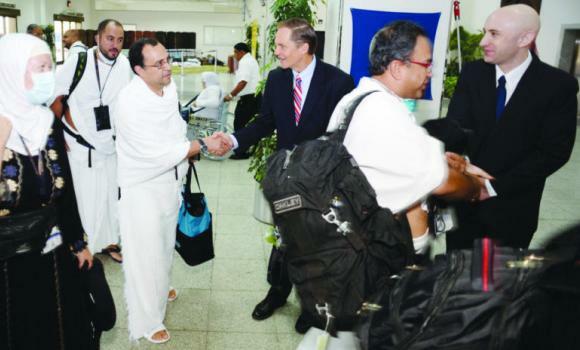 A large group of American pilgrims arrived at King Abdulaziz International Airport on a Saudi Airlines flight from Madinah on Thursday and were warmly received by US Consul-General Todd Holmstrom, along with Vice Consuls Vanessa Whittington, Kareema Dauod-Akguc and Morgan Miles. Upon arrival, the American pilgrims expressed their happiness over the personal reception and provided positive impressions about arrangements in Madinah, which made their stay there comfortable. The pilgrims, from dozens of US states, also thanked the Saudi authorities and US Consulate officials for their coordination and support. Tour operators escorted the pilgrims the short distance directly to their buses, which then took them to their places of accommodation in Jeddah. CG Holmstrom personally welcomed more than 100 pilgrims, wished them a blessed Haj and expressed hope that they would be able to perform Haj rituals with ease and comfort. Many of the pilgrims also requested that the CG pose for photos with them on their personal cameras and engaged in conversation with him and other representatives from the consulate.